The sound of Amirali can be described by using three words: space, depth and texture. Having burst onto the scene in 2012 with the distinctive sonic of his “In Time” LP, enormous critical acclaim was immediately bestowed on the talented live instrumentalist, singer, and songwriter. An architect by education, with an awareness toward the structure of sound, Amirali’s familiarity with all musical elements, and their balance, leads to the creation of full and fascinating compositions. With his Dark Matters imprint, a place for “weird” and “unusual” encouragement, Amirali has returned today with a new EP – “Odyssey”, which also features a Fort Romeau remix. This emotive, 3 track package showcases Amirali’s penchant for songwriting, as well as being a testament to his sonic identity, merging memorable harmonies with heartfelt vocals and complex soundscapes. 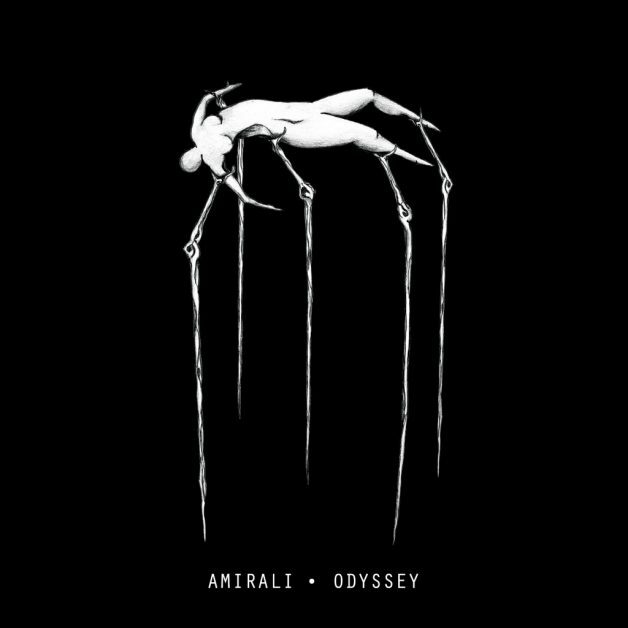 With a live set also in the works, and an adjusted approach to creation, Amirali gets personal in this far reaching interview in support of “Odyssey”. Today, you release your new EP – “Odyssey”. As I ask creatives of all descriptions with new projects, what was its original seed? Was it a certain idea, piece of equipment, a bassline in your mind, perhaps…? It all came together pretty quickly, sometimes I forget how the ideas come about afterwards. I sort of zone out during that initial musical moment when I’m trying to figure out how the track is going to play out. Those moments are short but they’re the most important parts of the writing process. Once I have that main idea the rest is like trying to finish a puzzle. Usually there’s no specific direction or plan when I go into the studio, I’d prefer to have a blank canvas in front of me when I start something. One day I come up with something really weird and obscure and the next day I could come up with a dance record but still retaining my odd perspective. Odyssey is a continuous escapade and there’s a lot of shifting in that voyage, I see a parallel universe, a universe quite different from what we have here, imagine you have otherworldly senses. I think that would describe the music best. The EP features its sole remix coming from Fort Romeau. How did he come to remix the track ‘Hidden Past’? What is it about Fort Romeau, as a creative, that interests you? I had finished a series of dance records including ‘Hidden Past’, then we started thinking about who we should get onboard to do the remixes and Fort Romeau was one of our top candidates. I’ve been following his work for quite some time now and I’m really into what he’s doing, so it just worked out. In 2018, I have been hearing you are developing a new stage show. What can you tell us about the concept behind this? What sort of A/V components are you looking to incorporate with it? I’m taking everything a few steps further; the logistics for the live shows will be quite intricate as I’ll be taking a lot of outboard gears with me on tour. There’ll be visuals that we are incorporating with the shows, what we are preparing visually is quite mind bending. In your release statement, you clearly mention that, sometimes as an artist, you need to take a step back and “do normal things”. As far as you are willing, can you expand a little on this? What do you mean by “normal things”? What are the kinds of catalysts that, for you, drive you to places like this? After touring heavily for over 3 years, I came to this decision that I’d like to take the classical band approach and get away every once in a while. I felt like I need to take a step back and give myself some space between each and every big tour, to hibernate and to get reconnected with my inner-self. I cannot make music in my hotel rooms or when I’m on the plane, that’s clearly not who I am. Making music is a much bigger medium to me than to just looking at the screen of my laptop with a pair of headphones. I’m here because of the love and passion I have for the music; In order to get the best out of myself creatively I need to disappear every once in a while and come back with something that I’m 100% happy with. I need to get away and think about what I want to do next and I think this strategy has helped me to evolve very quickly on both an artistic and a personal level. What can you say about effectively balancing home life and travel? With touring comes a lot of stress and anxiety. Catching flights after flights, 80% of the time you’re isolated especially when you’re on the road all alone by yourself throughout the whole year. You sleep alone, you eat alone, your sleep pattern is not normal; sometimes you don’t even get to sleep because you have another show in a few hours in another country. Sometimes you don’t even have anybody to talk to except to skype your family and friends. Meditation and Yoga really help even when you’re on the road. But as I said, I personally like to take a break from time to time in order to keep everything intact, it helps me artistically as well as mentally. I’m just a happier person when I follow this rule, I need some time away to nurture my creativity, that’s the most precious thing to me and it’s the only thing that keeps me going in life. You won’t be able to do that in full capacity when you are on the road all the time, it’s as simple as that. That’s why we have so much mediocre music coming out everyday. People in the music don’t want to give themselves some space to think and reflect. Everyone in the music now is so manufactured and so squared, it’s becoming very lifeless, which is very sad. At time of this talk, are you personally satisfied with your own ability to maintain this balance? I’m very satisfied with how things are going at the moment, I feel like I have finally found my right place as an artist, I would not accept gigs the way I did in the past, it’s more about quality than quantity for me. Finally, through the rest of 2018 (and beyond, if necessary), what are some things you are personally and professionally looking forward to? I have finally finished the long awaited album which I’m really looking forward to showing to the world. There’s also lots of amazing music coming up on my label Dark Matters with a lot more surprises. We are also in the process of putting together a few special one off live shows in a number of key European cities this year and next year which I can’t reveal too much about it at this time.